A data logger is a compact, battery-powered device equipped with an internal microprocessor, data storage, and one or more sensors, or sensor ports. Data loggers can be deployed in a variety of environments to record measurements at set intervals for up to years at a time, unattended. Depending on the particular data logger, measurements can include air temperature, relative humidity, AC/DC current and voltage, differential pressure, time-of-use (lights, motors, etc. ), light intensity, water temperature, water level, dissolved oxygen, soil moisture, rainfall, wind speed and direction, leaf wetness, pulse signals, room occupancy, plug load, and many more. A data logger can be a single-unit, stand-alone device that fits in the palm of a hand, or it can be a multi-channel data collection instrument equipped with one or more external sensors. How Do I Use a Data Logger? First, using the accompanying graphing & analysis software, connect to the logger and determine how you want to configure the logger (which sensors to sample, how to start your logger, how to stop it, etc.) Then deploy the logger in the selected location, where it will record each time-stamped measurement and store it in memory. After the desired monitoring period, reconnect with the logger and use the software again to readout the data and display measurements in graphs that show profiles over time. You can also view tabular data or export it to a spreadsheet for further manipulation. Data loggers are used in a broad range of indoor, outdoor, underwater and temperature-controlled environments – essentially anywhere data is needed and the convenience of battery power is preferred. What are the different types of data loggers? 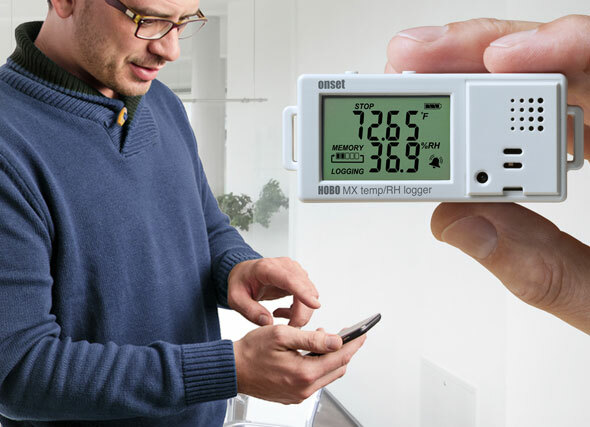 The four main types of data loggers are: stand-alone USB data loggers, Bluetooth Low Energy (BLE)-enabled data loggers, web-based systems, and wireless sensors (data nodes). USB data loggers are compact, reusable, and portable, and offer low cost and easy setup and deployment. Internal-sensor models are used for monitoring at the logger location, while external-sensor models (with flexible input channels for a range of external sensors) can be used for monitoring at some distance from the logger. USB loggers communicate with a computer via a USB interface, but for greater convenience, a data shuttle device can be used to offload data from the logger for transport back to a computer. BLE-enabled loggers are also compact, reusable, portable, easy to set up and deploy, and offer the added benefit of being able to measure and transmit data wirelessly to mobile devices over a 100-foot range. These loggers are particularly useful in applications where deployments are in hard-to-reach or limited-access areas. Without having to disturb the logger, you can use a cell phone or tablet to view data in graphs, check the operational status of loggers, share data files, and store data in the cloud. Web-based data logging systems enable remote, around-the-clock, internet-based access to data via cellular, WI-FI, or Ethernet communications. These systems can be configured with a variety of external plug-in sensors and transmit collected data to a secure web server for accessing the data. Wireless sensors, or data nodes, transmit real-time data from dozens of points to a central computer or gateway, eliminating the need to manually retrieve and offload data from individual data loggers.